How often have you been on the go and got totally caught short in a place with no gluten free options? If there were more places with the approach to gluten free quality food as Red Box Coffee in Haymarket Station, it would be a thing of the past. This coffee and tea outlet has a striking design and a really strikingly good approach to GF eating! When I dropped by, there were options including a very tasty bacon and avocado sandwich on brown bread; a superfood salad; crisps; brownies, Dundee cake; muffins and other treats. There are even plans to include gluten free wraps and toasties too. 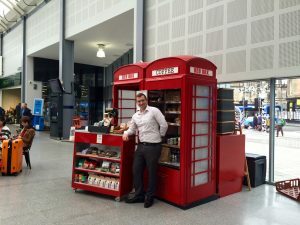 This is a brilliant place to pick up a good quality fresh coffee plus a takeaway, or just sit beside the red phone boxes and enjoy a seriously good choice of gluten free food while watching people run for the train. 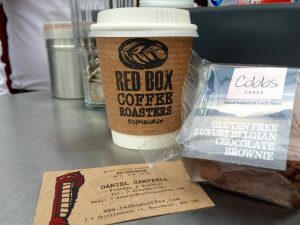 A member of the Cobbs family, which produces a great range of wholesale gluten free cakes and bread from its base in Drumnadrochit, owner and roaster, Daniel Campbell, is passionate about ensuring there are plenty of choices for the gluten free eater. His ethos is also to offer good quality food and drink, with delicious looking fruit juices, fruit and salads, as well as healthy and just downright delicious, GF and mainstream options. 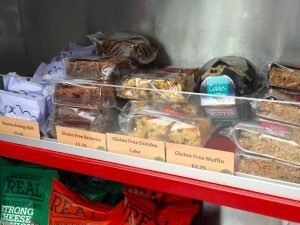 While visiting I picked up a small bag of things to try and my gluten-eating teenage testers and I tried the Dundee cake, the brownie and a chocolate chip muffin, as well as the bacon and avocado sandwich. This food did not last long and was declared as good as the “normal” versions. I was particularly impressed by the very “normal” sandwich – I haven’t eaten a sandwich as good as this in a long while. So when you are next on the train to Glasgow, you know where to fetch your sandwich and coffee. And with the super “naked” cafe, Gramms, opposite, life in Haymarket for the gluten free eater is definitely looking up.